The penultimate release in the ‘X LP’ series, ‘Xtra Part 2’ is a pair of bonus tracks that don’t appear on either of the ten-track albums. 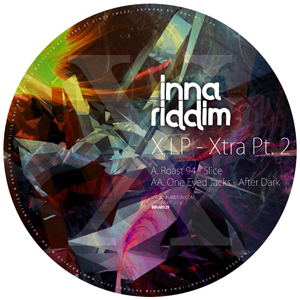 The drum&bass element that predominated in the first Xtra release is represented here in the first track, ‘Roast 94’ by Inna Riddim head honcho Slice. As the title suggests, the tune is a throwback to the heyday of tech-step: a rollicking bassline rides neck-snapping beats, overseen by judiciously deployed MC samples. It’s a midnight kind of tune: the warm-up set is over, and it’s time to stop chatting by the bar and get sweaty on the floor. On the flip, After Dark’s ‘One Eyed Jacks’ lowers the tempo and raises the funk: the tune glides forward hovercraft-like, suspended on a cushion of warm and steady bass pressure and decorated with exotic minor-key melodies, while clipped snares offset an insistent tattoo of kicks. Two midnight tracks, then, but for different moods: one’s a Jägerbomb, one’s a dry Martini.